Grow your business with the power of radio advertising! Customers are busy and Jammin 107.7 goes with them in the car, at home, and at work. 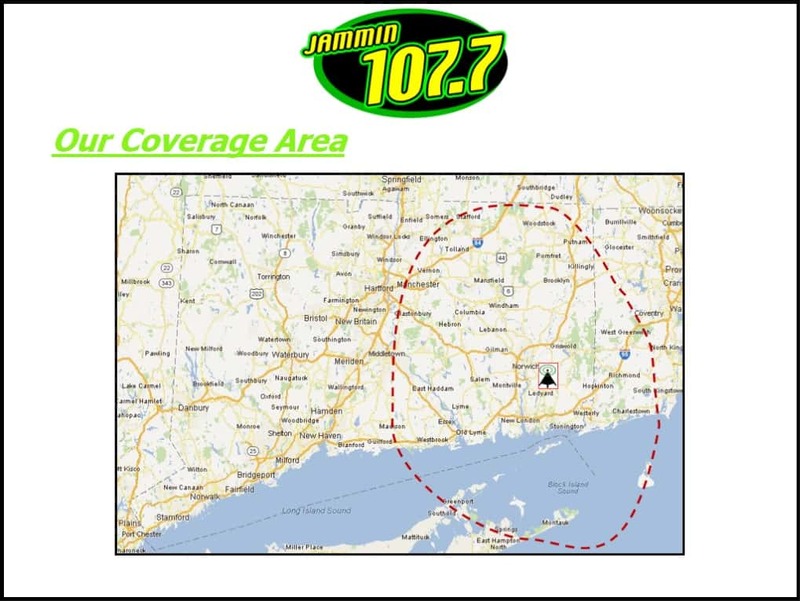 Jammin 107.7 broadcasts with a state of the art transmission facility from the highest radio tower in eastern connecticut. Jammin 107.7 was launched in 2002, and has been a leader in the eastern connecticut radio market ever since then! We love to brainstorm and develop strategies to increase your sales and profits. We are so sure that our emergency marketing team can get results and response for your business that we will meet with you and then write and record a commercial without charge or any obligation. We understand that if you get results we have you as an advertiser for a very long time. Most radio companies own hundreds of stations…Their focus is corporate stockholder dividends and profits. Jammin 107.7 is a refreshing change from pre-programmed corporate radio. Increase your business with advertising on Jammin 107.7! For more information call 860-464-1066.